After a rocky year, a recent visit marks a turning point in bilateral ties. Nepalese Prime Minister Khadga Prasad Sharma Oli’s six-day visit to India in February took place at a time when bilateral ties between the two countries have reached a low point, battered by the Madhesis’ agitation against Nepal’s new constitution. The unrest has left more than 50 people dead, leading the Madhesis to block all crucial entry points on the border with India. This in turn created shortages of essential commodities in Nepal. Unfortunately, the Nepalese government felt that the blockade was done at the behest of the Indian government, placing a serious strain on bilateral ties. It was primarily in this context that Oli’s visit was seen as an attempt to dispel any misunderstanding. Since the Modi government came to power in May 2014, New Delhi has reoriented its foreign policy to boost bilateral ties with Nepal. Relations between New Delhi and Kathmandu during the ten years of the UPA government had reached an all time low, with all mainstream political parties in Nepal doubting India’s commitment to facilitating the process of writing a new constitution in Nepal, despite the fact that India had played a crucial role in ensuring the success of Nepal’s democracy movement. Another reason for the Modi government to engage Kathmandu at the highest political level is China’s increasing investment in the infrastructure, energy and other sectors of Nepal. There is a consensus among Indian strategists and experts that as Pakistan already enjoys goodwill with some sections of the Nepalese, China’s involvement in the Himalayan country could facilitate the emergence of a China-Nepal nexus against India. The Modi government has also correctly realized the need to sustain the dialogue process with Nepal to ensure that the interests of the Madhesi region, who have close cultural and family ties with the people of Bihar and Uttar Pradesh, should be reflected in its new Constitution. The first signal of the Modi government’s desire to deepen bilateral ties with Nepal appeared when Modi invited all heads of government of the South Asian Association for Regional Cooperation (SAARC) to his swearing-in ceremony. Since then, New Delhi has taken a number of steps to renew relations with Kathmandu. In July 2014, External Affairs Minister Sushma Swaraj visited Nepal, initiating a dialogue between the two countries. Later, Modi became the first Indian prime minister in seventeen years to visit Nepal, traveling there twice, in August and November 2014. These visits were viewed as historic in taking India-Nepal relations to a new level, with India announcing a soft credit line of $1 billion for infrastructure, irrigation and energy projects. When Nepal was struck a massive earthquake in April 2015, India immediately sent personnel to take part in the rescue efforts. Indian media also went to cover the rescue operation. However, Nepalese recoiled at the presence of Indian media on their soil, charging the Indian government with indulging in a cheap public relations exercise. The Nepalese described coverage of the earthquake by India media as “insensitive” and “intrusive.” Indian search and rescue teams were asked to leave Nepal. The reaction embarrassed New Delhi. Still, the India government was restrained, choosing not to openly express its disappointment at the unexpected conduct. Before bilateral ties could recover from Kathmandu’s mishandling of the earthquake episode, Nepal faced unprecedented political turmoil, as the Madhesi region in the south of the country began protesting against the new constitution adopted by the Constituent Assembly (CA)-II in September 2015. Despite the CA-II’s claim that the constitution, seven years in the making, has not only transformed Nepal from an officially Hindu monarchy into a secular, federal country of seven states, but also protects the interests and rights of all Nepalese communities, protesters claimed that the new constitution ignored their rights and interests. In particular, the Madhesi and Tharus felt they had been sidelined in the process of making the constitution. They argued that the boundaries of the states have been demarked in such a way that their voice would be neglected, because they find themselves in a minority in every state. The protesters have a point: Despite accounting for more than 50 percent of the Nepalese population, the Madhesi region got only 65 seats in a 165-member parliament, while the less populous hill and mountain region got 100. The new constitution says that only citizens by descent will be entitled to hold the posts of president, vice-president, prime minister, chief justice, speaker of parliament, and some other important political posts. This clause is seen as discriminating against the large number of Madhesis who acquired citizenship by birth or naturalization. In contrast to the interim document, the new constitution does not accord equal citizenship rights to Nepalese women marrying foreigners, although it does to Nepalese men. Soon, India found itself entangled in Nepal’s political unrest, as the Madhesi people blocked all major entry points from India to Nepal, bringing the movement of goods to a standstill. Nepal’s media erroneously claimed that India had an invisible hand in the blockade. In fact, rumors spread that the Indian government was helping the Madhesi people, believing that a pro-Madhesi stand would help the BJP at the Bihar Assembly elections. Oli himself accused India of carrying out an “unofficial blockade” in Nepal and raised the issue with UN Secretary General Ban Ki-moon. India strongly rejected the allegations, arguing that the blockade was on the Nepalese side, not the Indian side. The months-long agitation led to a huge scarcity of essential goods and petroleum products in Nepal. Oli came under fire from domestic rivals for not acting to end the protest. In addition, Nepal also learned that poor road connectivity meant that China had a limited ability to provide fuel and essential goods. Keeping these factors in mind, Oli agreed to amend the constitution. Consequently, in January three articles of the new Constitution – Article 42, Article 84 and Article 286 – were amended to facilitate greater representation in government bodies on the basis of the proportional inclusion of the Madhesis. India described the amendment as “welcome developments,” hoping that other outstanding issues could be similarly addressed in a constructive spirit. The agitating groups also removed the blockade at the checkpoints, allowing for the movement of goods to resume. At the same time, India sent a high-level all-party delegation led by External Affairs Minister Sushma Swaraj to pay their respects to former Nepalese Prime Minister Sushil Koirala. This gesture further helped ease the tension between the two countries. On its side, within hours of the end of the blockade Nepal announced Oli’s visit to India. The Nepalese prime minister’s visit was a breakthrough. 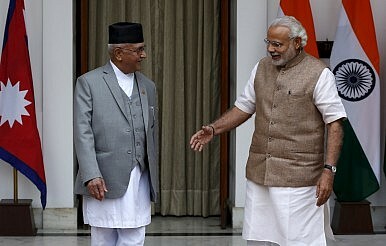 While Modi called Nepal’s constitution a “major achievement,” Oli said that the main mission behind the bilateral visit to India was to “clear the misunderstanding.” Oli also said that his country is and will remain a “reliable” friend of India and that he wanted to “move forward in the relationship, which is not man-made but entirely natural and civilizational.” The two leaders reviewed the bilateral ties and signed seven agreements. These agreements include an Indian grant of $250 million to Nepal for post-earthquake reconstruction in four sectors: housing, health, education and cultural heritage. The two leaders also expressed their commitment to preventing the open border between the two nations from being misused by terrorists and criminals. The visit by the Nepalese prime minister to India has certainly helped bridge recent differences between the two countries on the Madhesi issue. Engagement between New Delhi and Kathmandu has underscored the Modi government’s priority towards its neighbors. Now the two countries need to strive to restore the goodwill that was generated by Modi’s trips to Nepal in 2014. Sumit Kumar is ICSSR Doctoral Fellow at the UGC Centre for Southern Asia Studies, Pondicherry University.